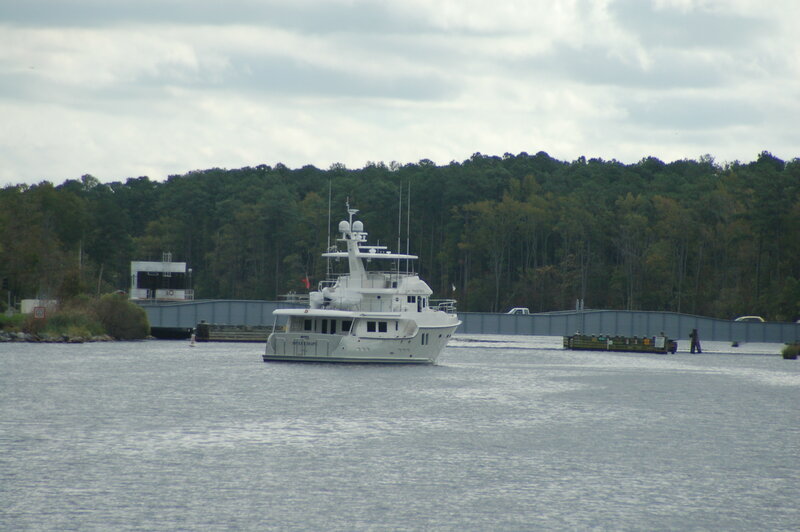 With the engines now repaired and fully serviceable, it was with anticipation that Shear Madness finally departed Colonial Beach Marina at midday to head south for repairs, via the Intracoastal Waterway (ICW). For this trip Shear Madness, with all her navigation, bow and stern thrusters, communications, and electronics systems still not functional (we had a handheld GPS, laptop computer, and handheld VHF), was following ‘Sweet Hope’ (Nordhavn 64ft) with Captain George and Leanne jumping ship to provide crew support for George. With limited VHF radio capability on Shear Madness, hand held walkie-talkie radios between the two boats provided easy communications. After our radio call signs of ‘Madness’ and ‘Sweetie’ were established we were ready to depart. 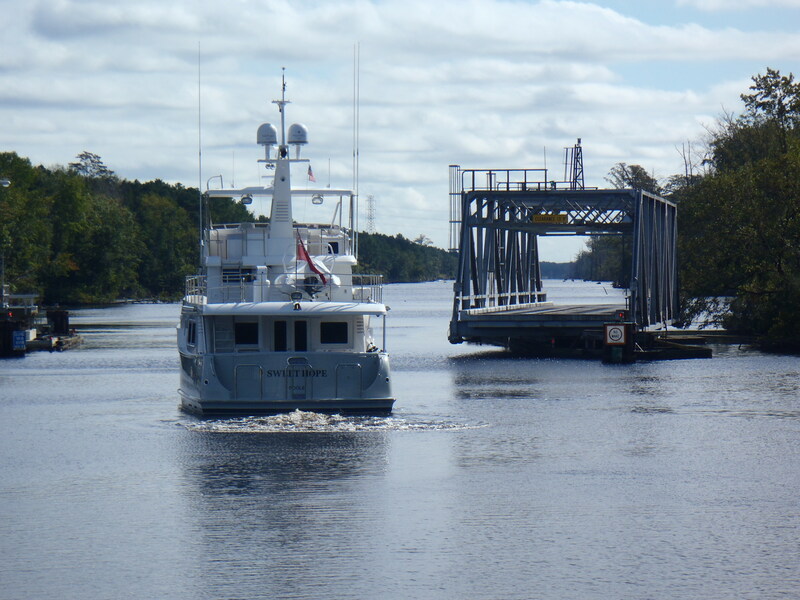 With Sweetie departing first and standing off the dock in case assistance was required, Bradley successfully exited the dock, proving that bow and stern thrusters are not required, and we were on our way. 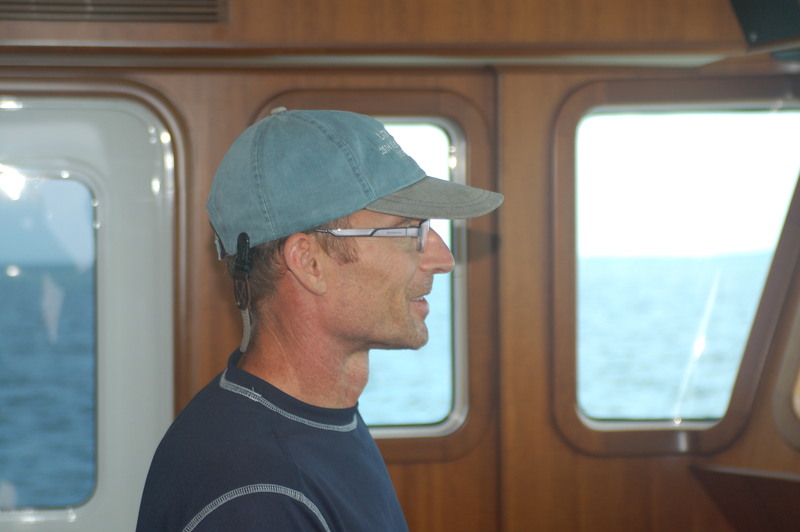 With a light breeze, calm seas and following in the wake of Sweetie it was fabulous to be underway again. 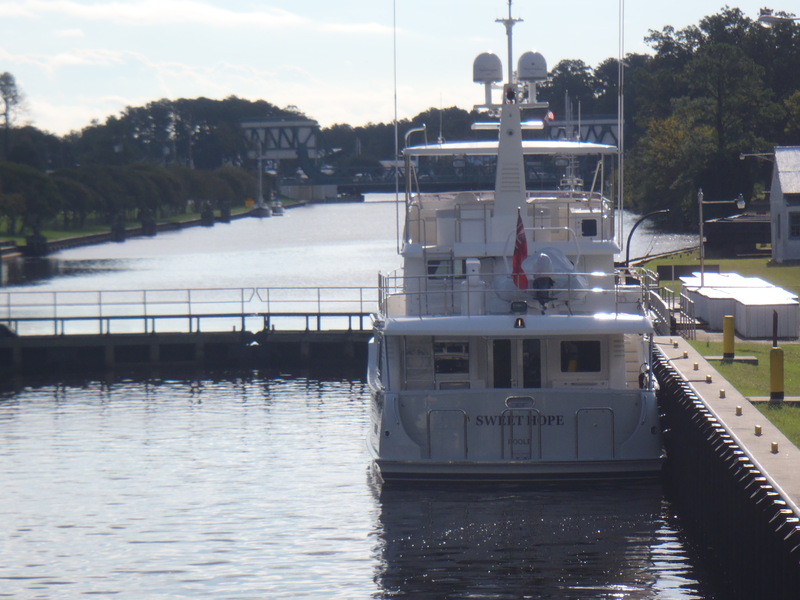 Sweetie was the ‘eyes and ears’ for Madness providing regular information on depth, boat traffic, relaying information from the VHF traffic and importantly where to anchor. The first day was an easy run of 35 miles down the Potomac River back into the Chesapeake Bay. 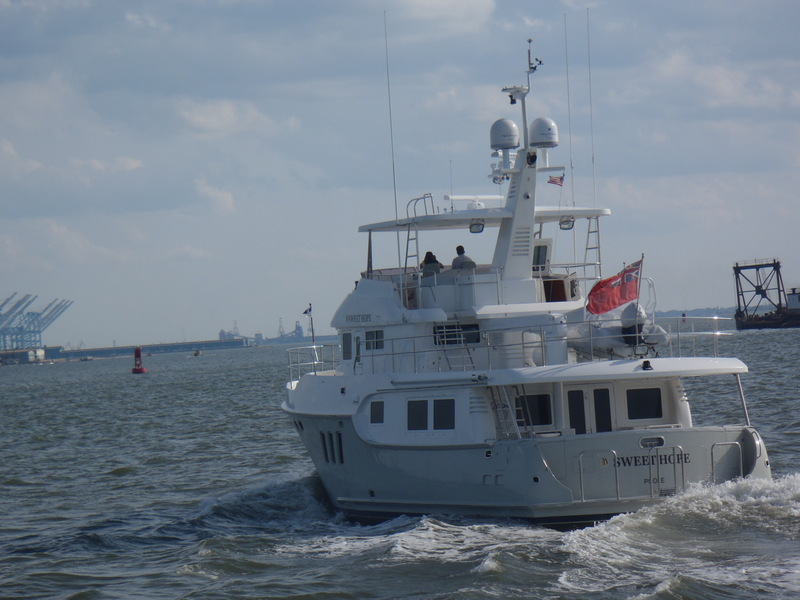 Thankfully Madness experienced no major problems and was able to enjoy the day on the water. During each day the engines needed to be run on ‘wide open throttle’ mode (good engine husbandry) which resulted in Madness powering past Sweetie with a loud ‘Yee-haw’, only to slow down to wait for Sweetie to take the lead again. 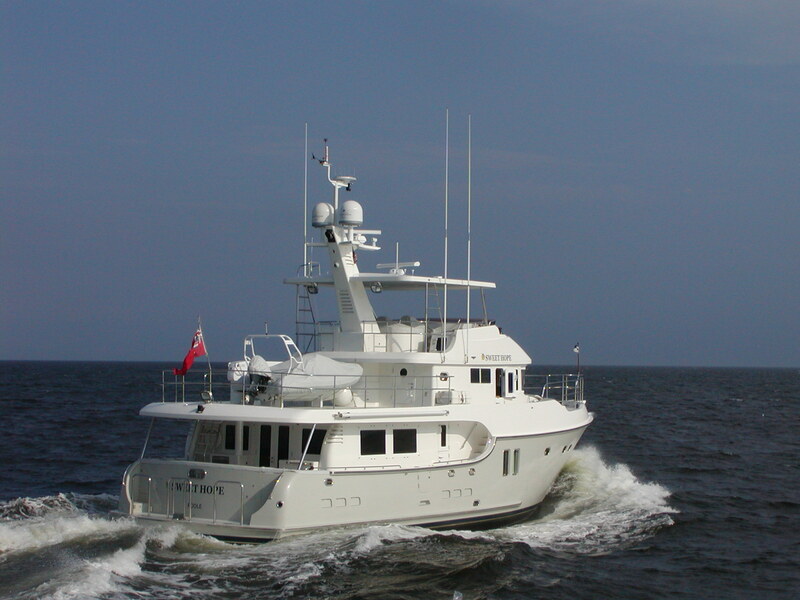 (Note from Kathy – Racing Nordhavn’s seems a bit like racing Clydesdales – not real fast but LOTS of power!). For our first anchorage, George found us a picturesque local river to enjoy the tranquil setting and sunset. Part of the deal for Leanne going onboard Sweetie was to assist George in improving his culinary skills. Leanne took up this challenge and provided a 101 Cheesecake making lesson to George. Given how quickly the cheesecake was consumed Leanne reports the lesson was a success! As the sun rose we had the anchors stowed and were on our way south. After a longer day of 85 miles we arrived safely at Portsmouth, with the Sweetie team being hosted for an enjoyable dinner on Madness with the inevitable ‘onboard stories’ being recounted. Portsmouth is a beautiful town steeped in history with numerous marinas, great architecture and ambiance and is just a short ferry ride across from Norfolk. 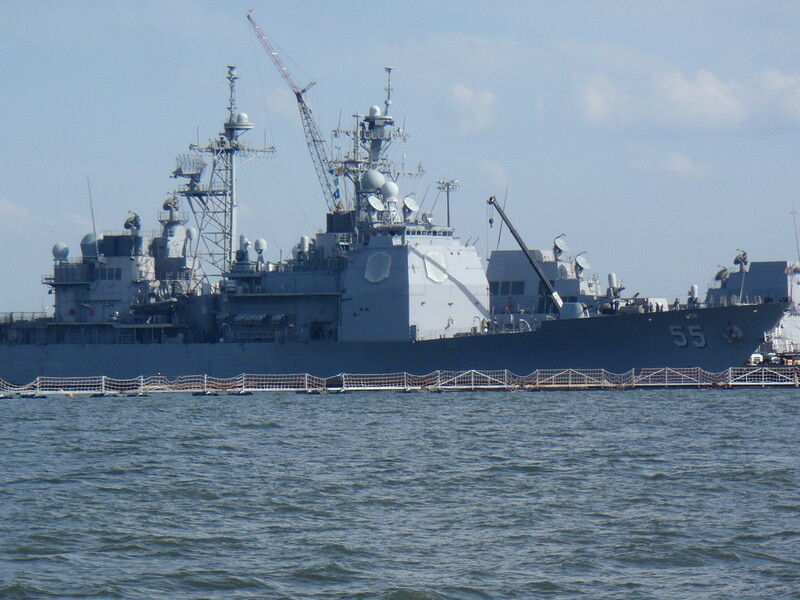 Norfolk and Portsmouth are home to naval shipyards and container ports so there was plenty of shipping to watch out for. Fortunately we had two nights at Portsmouth to allow the engine technicians to come back on board to replace a few more parts and give the engines a tune-up, which gave all of us a welcome break and time to explore the local area. Early Saturday morning saw us departing Portsmouth to enter the ICW at mile zero. 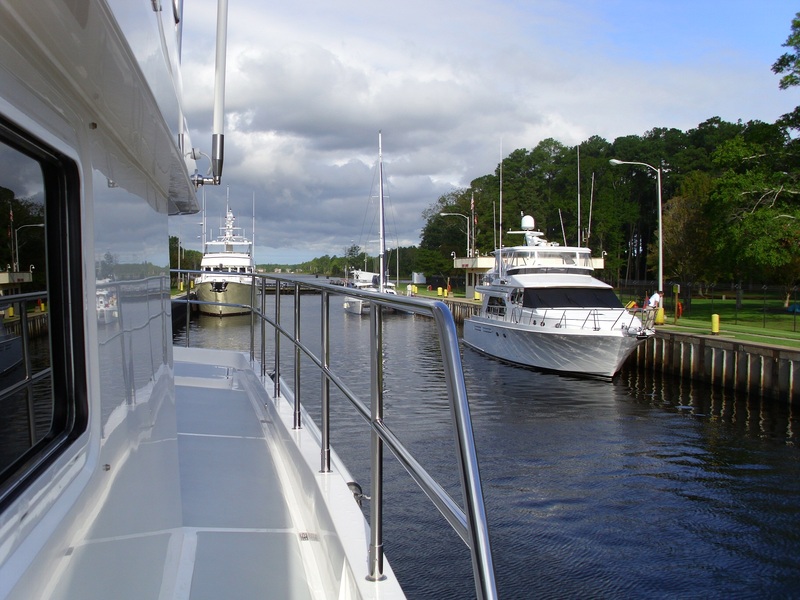 The ICW is a series of interconnected rivers, canals, and sounds that provide protected passage from Norfolk to Florida. 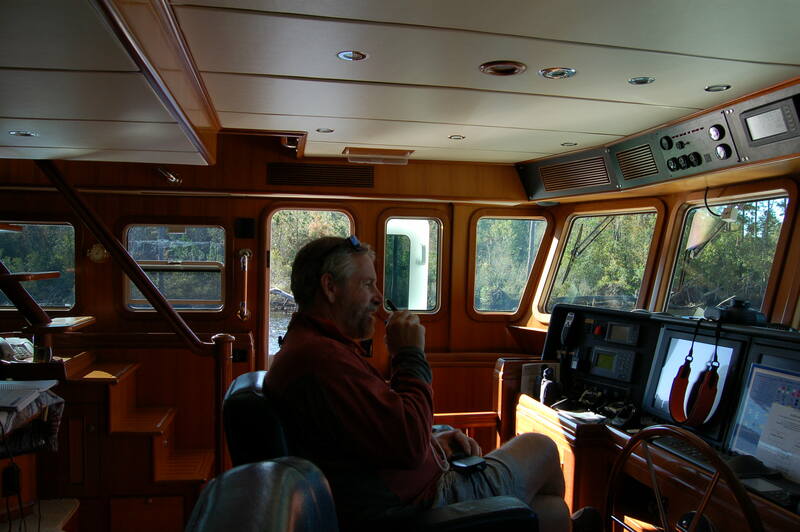 The ICW is ideally suited to boats with a shallower draft, but with careful reading of the charts and constant watching of the depths we had no problems coming down the ICW. 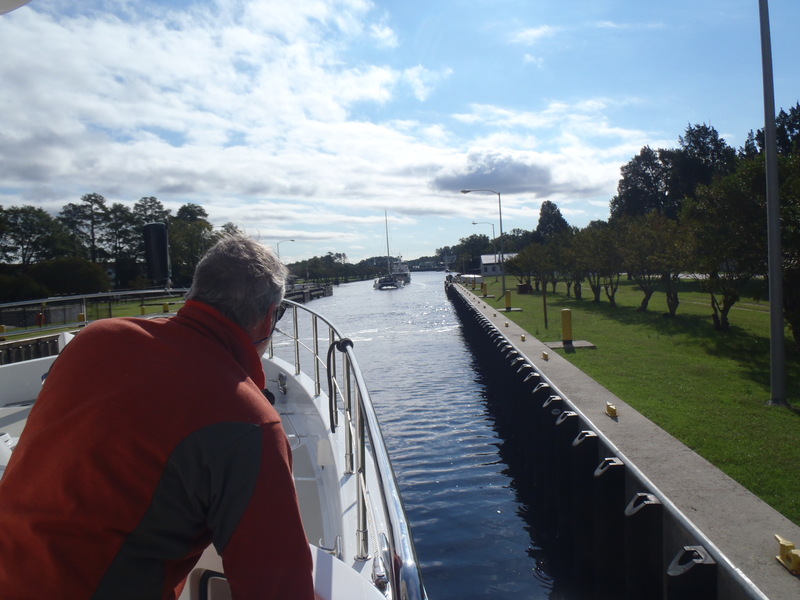 Our route was via the Virginia Cut which saw us passing through one lock, and 22 bridges. The first 11 miles were busy ones with 7 bridges and the one lock to pass through. The majority of the bridges were opened on set hours so required time management to ensure we arrived when the bridge was due to open and not before. Unfortunately we learnt this lesson the hard way with a 45 min wait for one bridge to open. This was also our first trip through a lock. A lock is a mechanism for joining together two bodies of water at different levels. In this case, we were going from a higher point to a lower point. 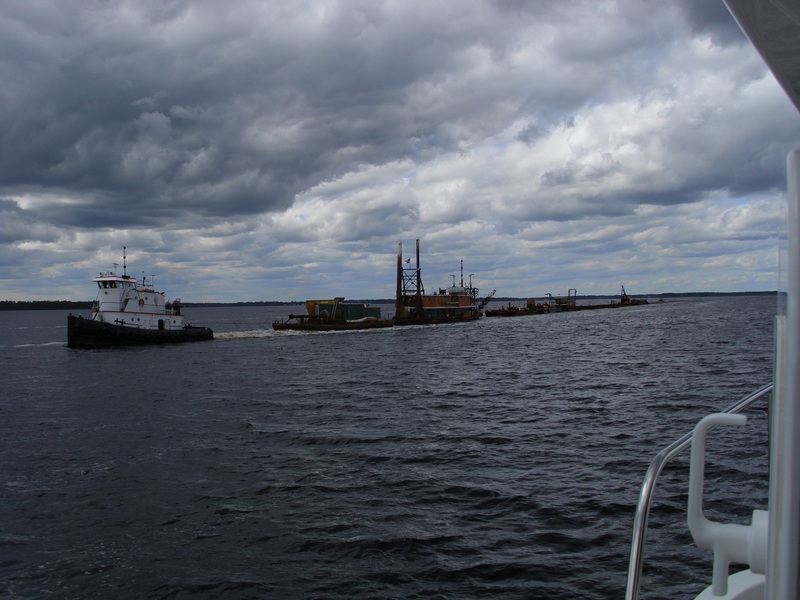 To accomplish this, the lock gates ahead of us are closed, all boats wishing to get to the other side enter the lock and dock alongside. Then the gate is closed behind us and the water level inside the lock is reduced bringing all boats down to the level of the lower water. When complete, the front gate is opened and all boats continue on. Then boats heading the other way enter the lock, the gate is closed, water is put back into the lock to raise the boats, and off they go. Fortunately, it was an uneventful but interesting experience for all of us. The ICW was a scenic route to travel, passing through a variety of rivers, bays and canals with the scenery changing frequently. There was plenty to watch both on the water and off as we passed through the many local towns. The barges were always interesting to watch, especially given the loads some of them were pushing. One was at least a mile long, literally a “sea-train”. 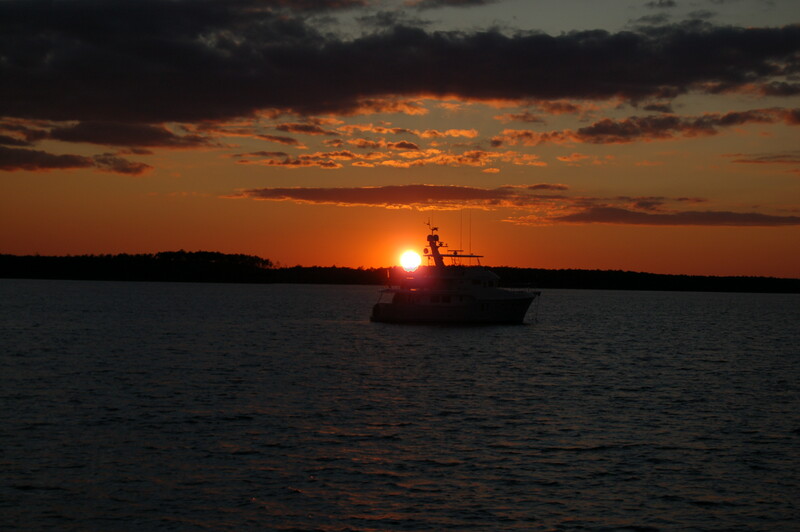 Sunday night was spent in a bay anchoring after passing through mile 160. 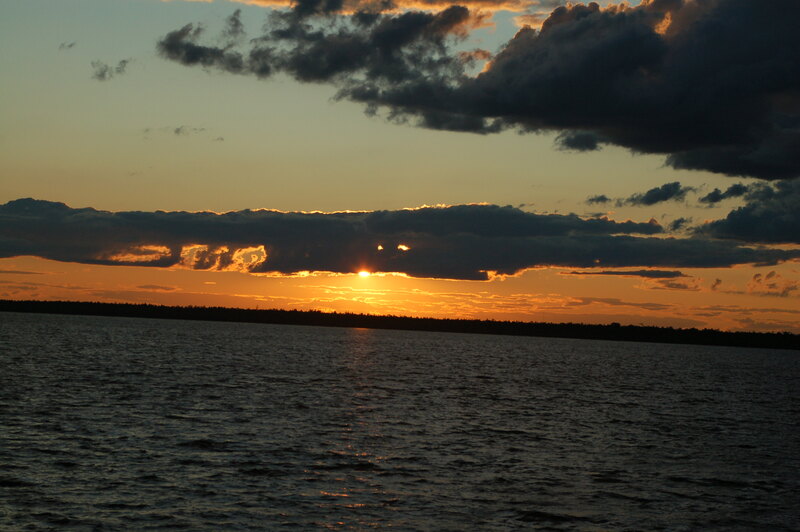 This was a large bay with only Sweetie and Madness anchoring providing another peaceful night to watch the sunset. 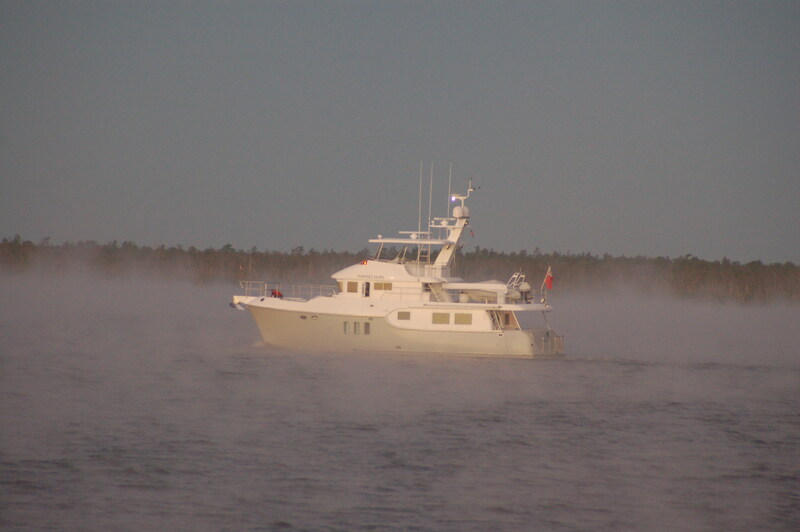 Next morning was a relaxed departure at 0730 with the boats being surrounded by fog which gave it quite a surreal atmosphere to motor away from. Our last day on the ICW was a short 45 miles to reach our final destination of Jarrett Bay Boatworks where Shear Madness is to be hauled out of the water to start the repair process. 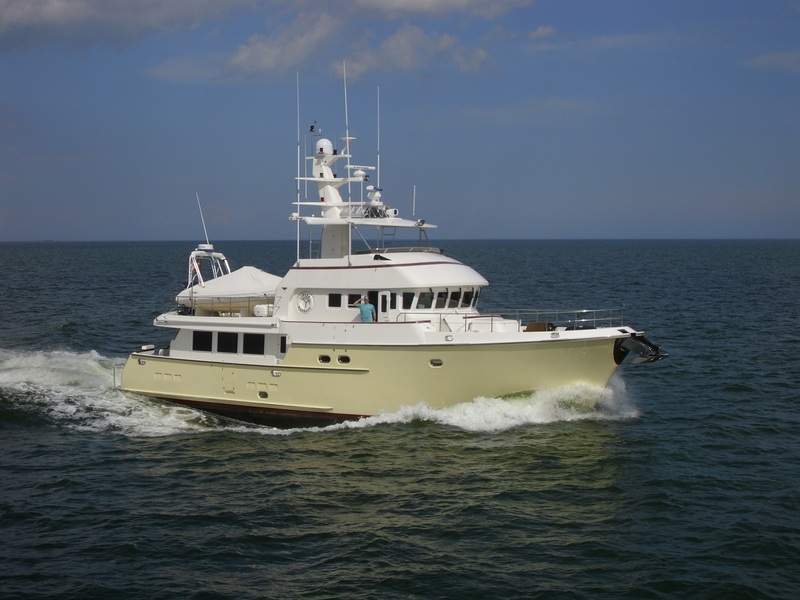 The ICW was a most successful trip, with no problems managing the depth or shoaling, and one we would consider again as opposed to the outside passage which can be a lot rougher and more difficult past Cape Hatteras. 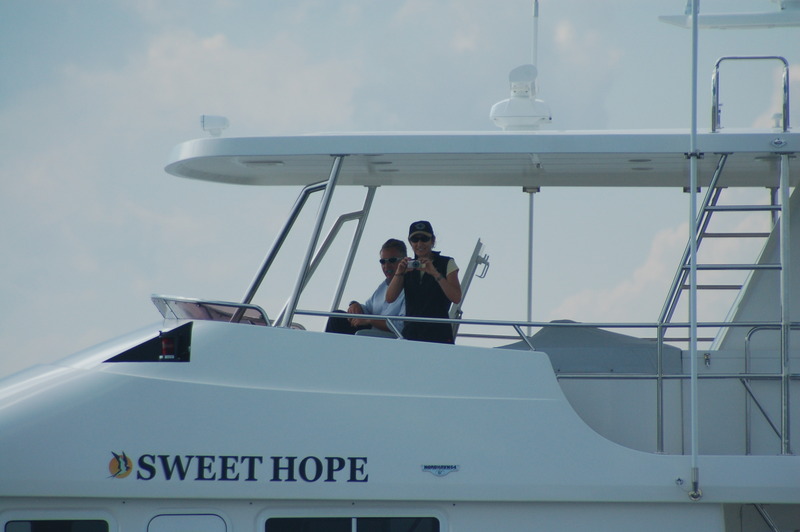 Without Sweetie and Captain George, assisted by Leanne, Madness would not have been able to complete this trip. For this we remain grateful to Captain George for leading the way and being our ‘eyes and ears’. Click on any photo to enlarge. Please leave a comment – we love to get feedback! 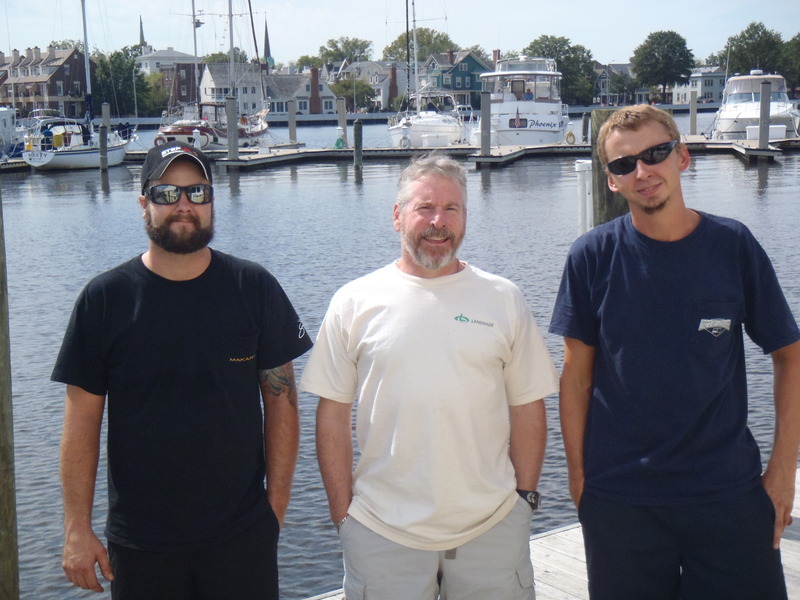 Chris and David from Western Branch Diesel with Bradley – they got the engines operational for this trip! This entry was posted on October 7, 2011, 4:58 pm and is filed under Trips. You can follow any responses to this entry through RSS 2.0. You can leave a response, or trackback from your own site. Yeez Bradley you dig a big hole at WOT. You can see where all the diesel’s going! We got a 1st & 5th in the first race of the Winter series and only blew two spinakers in the 25knt conditions; that accounted for the 5th place. I think we should put up the small ones first and see how we go rather than the other way around. Who said yachting is cheap because you dont have to buy fuel. As far as the World Cup goes; I’ll let John live with his fantasies for another few days but be gentle on him after our win on Saturday please; he’ll be a mere shell of his former self after we crush NZ like a kiwi fruit in a blender. Once again the story is wonderful never ending story’ of water, sunrises, sunsets and beauty all around you – how fantastic for you both! And it seems like wherever you go you meet great people to ‘cruise’ with. 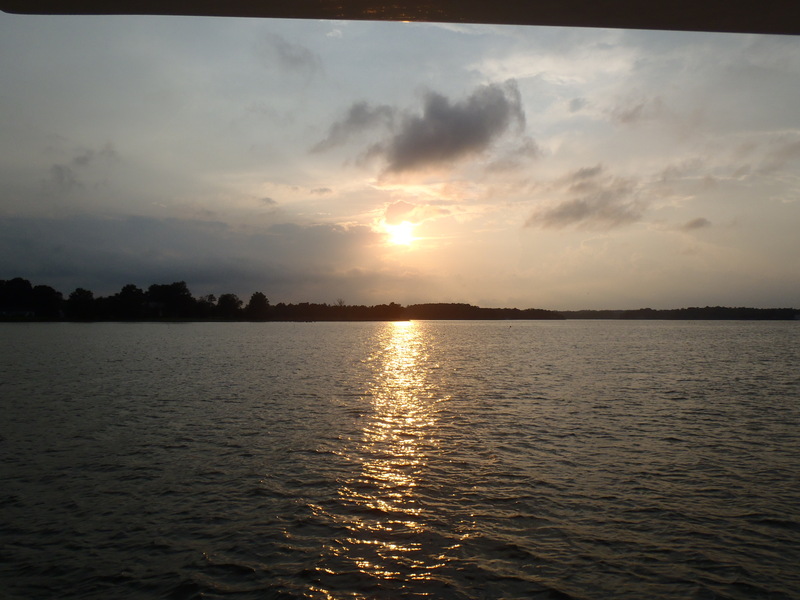 Continue to safely enjoy your ‘boating’ and DON’T STOP WRITING – it is so much fun to read about your experiences! 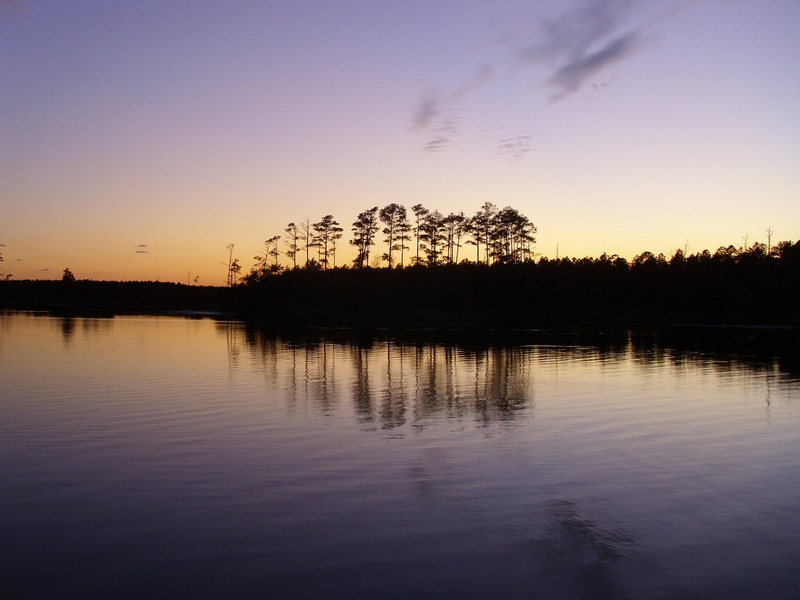 I had to look twice when I saw your location – the house we are renting is near Havelock, North Carolina!